Are You Too Old To Learn Music Theory? 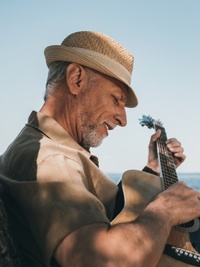 Recently I noticed a strange trend in online forums and discussion boards among players who have learned to play guitar by ear and have some experience under their belt. These players often ask for help with very precise and pertinent questions (which is good) and receive helpful answers. Then the person who answers them also suggests that the player who asked should learn some simple music theory, as it answers many other questions of the same kind. "I’ll be 63 next spring, and just don’t have enough good years left to absorb and profit from it." I find these answers puzzling: in my experience as guitar teacher I had students in their late 80's and they were great students. Why do some people think they are too old to learn? And would learning theory make sense for someone that can already play by ear? Let me tell you the story of Nick. Nick was an amateur composer, and at the time of our story he knew how to read music, but knew nothing about music theory (he did not know the names of intervals or of chords). Despite that, Nick composed a few pieces by ear, and due to his knack for good melodies and some personal acquaintances he was also able to get these pieces played by an orchestra (he orchestrated the pieces himself, by ear and with a lot of trial and error). In fact he got locally famous because of it. When he was 27, he was offered the place of Professor of Composition and Orchestration at a conservatory. To stay ahead of his students, he spent all the time he had reading music theory manuals and doing all the exercises he could. After 3 years of study, he revised all his previous compositions: the new knowledge he acquired. He also became a great fan of music theory. We can agree that at 27 Rimsky-Korsakov was not particularly old... but we are talking about a composer who was accomplished enough to have composed two major works ("Sadko" and "Antar") and to be offered a place as a Conservatory professor based on those pieces. When It's Too Late Too Start? "Ok, that but that Rimsky fella was 27. What if I am twice his age?" I see your point here. Let me answer with the story of Josh. No, Josh is not a famous composer like Rimsky-Korsakov. Josh is a good local guitarist and bassist, he played in a number of bands, and he became a student of mine at the young age of 60, after retiring from his day job. Now, when I started working with him, Josh could definitely play. I did work with him to perfect his physical technique, but the foundation was already there so we did not spend too much time there. Where we spent the most time on was music theory. And he DID study as hard as he could. After a few months working with me, Josh was able to pass the audition to enter into a pretty successful professional local band, and now he spends his evening playing well-paid gigs and having lots of fun. He told me more than once that he was able to land that gig (and perform the way he is performing now) only thanks to the music theory we studied together. Knowing theory gave his playing that extra boost that he needed. So You Can Teach An Old Dog New Tricks? Definitely. I know that most people think that to learn a musical instrument (or music theory) you need to be young and/or start when you are a kid... but in my experience as music teacher I found that his is simply not the case. Adult and elder students actually tend to learn faster than kids. This is because 1. they are usually more motivated 2. they have a longer attention span and 3. they know that they do not have all the time in the world to learn: they want to learn it NOW. I have seen many students in their 70's or 80's learn new things. One of them, a very energetic elder woman, STARTED to play guitar from scratch when she was 88. As long as you do not put yourself down with thought like "I am too old for this", you are literally never too old to learn. Now, I have a favour to ask to all of you. If you know any 'older' players who feel discouraged or think they cannot learn anything new... forward this article to them. Help them by letting them know that regardless of their age, they can learn, they can get better, they can still have fun with their guitar. And if you want to keep learning, check out these music theory for guitar courses because they are awesome.